Battery powered exterior led lights that provide lighting in the most inaccessible places because you don’t need cables or power. Outdoor lighting anywhere you want! By hiring the battery operated Par Can 64 with LED wifi connectivity you can create some amazing coloured backdrops. They can be used in any outside venue because no cables or power are needed. We will set up the colour scheme you require and then it is simply a matter of pushing the pre set button. Good lighting transforms a beautiful event or venue into something amazing and very special. One battery powered exterior led light will light up a tree with any colour of your choice. Hire multiples to light up a driveway of trees to make a grand entrance. Because the battery operated Par Can 64 has such a wide angled dispersion you can cover a larger wall with less light. Hire more lights when you want to cover a larger wall in light, or add to the corners in a smaller space to create a contrast against the normal walls. We offer a free no obligation on site survey and are happy to advise the best lighting for your event or venue. 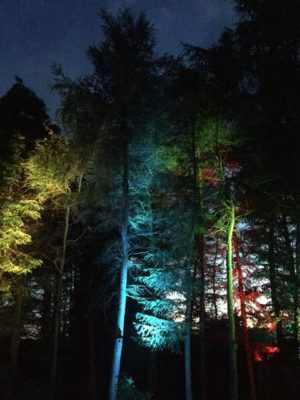 Blue Sky Events have had the honour of illuminating some of the most beautiful venues and sites in the North of England. Our team have transformed spaces and venues for organisations like the National Trust, the Devonshire Group and Chatsworth Estate. We have lit walkways for beautiful wedding settings in the Lake District, the Yorkshire Dales and the Trough of Bowland. Being centrally based means we work all over the North of England, especially at the grand houses, hotels and venues in the Lake District, the Yorkshire Dales, Lancashire, Yorkshire and Manchester.